You might be moving across town or just down the street, but there will still be tasks that include packing, moving, and unpacking your entire house. These things can be heavy, awkward, and require careful loading in and out of a truck. A local move can produce just as many challenges as a long distance move which is why you may want to consider the skilled services of local movers from North Whales, PA. Suburban Solutions moved many people throughout multiple states. Our North Whales, Pennsylvania team of movers and fleet of trucks can handle nearly any task – big or small. With an outstanding reputation, backed by real reviews, you can count on Suburban Solutions make your local move our top priority. 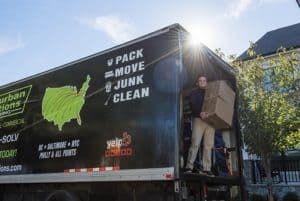 If you want your local move to go as smoothly as possible, consider these pro tips from our very own team of movers from North Whales, PA. When you decide to move, start cleaning out your closets, cupboards, the attic, garage, and basement. Reserve a local moving company 3-6 weeks before the move; especially in the summer. Ask the moving company if they are insured. Submit your new address to the utility companies and postworker one week before your move. Schedule a disconnection time for all the utilities in your current home. Make sure your utilities will be turned on in your new home, by the move in date. Cancel your cable, newspapers, lawn service, and other services one week before the move. Don’t pack your cleaning supplies until you’ve done your final cleanup. Or, you can talk with Suburban Solutions to learn more about our cleaning services. Begin to pack up things won’t need or use. Don’t forget to put the small parts of furniture and electronics into a small, sealable bag. Before you move a large appliance, review the owner’s manual to verify whether or not any special handling is required (i.e this often applies to dishwashers, washers, and dryers). Be sure to disconnect your electronics. Don’t forget about yard items, or anything you might have securely hidden in your house. Dispose of items that a moving company cannot legally transport (i.e. gasoline). Prepare an essentials bag with items like a toothbrush, phone chargers, medications, etc. Keep your children occupied, or give them basic jobs to do. Hint: Ask them to decorate a box that will go to their room. Have snacks and cash on hand. Use padding to protect your flooring against scratches. When you’re looking for professional, insured mover who are experienced, honest, and friendly, you can count on Suburban Solutions. We pride ourselves in our timely arrivals with supplies and tools ready to go. We’ll treat your home with the utmost care and respect; the same principle will apply to your belongings. When you’re local move is complete, you can happily resettle while knowing you chose the right movers from North Whales, PA.
Stay on a budget by choose the services you want. We offer a broad range of moving and cleaning services that are available at competitive pricing. Once you decide, we’ll provide you with a transparent quote, free from hidden fees. No one knows North Whales, Pennsylvania better the movers at Suburban Solutions. We are proud to be able to support the community. Regardless of what you need, we are ready to help. To receive a complimentary quote for your upcoming local move, contact the movers North Whales, PA trusts at Suburban Solutions.